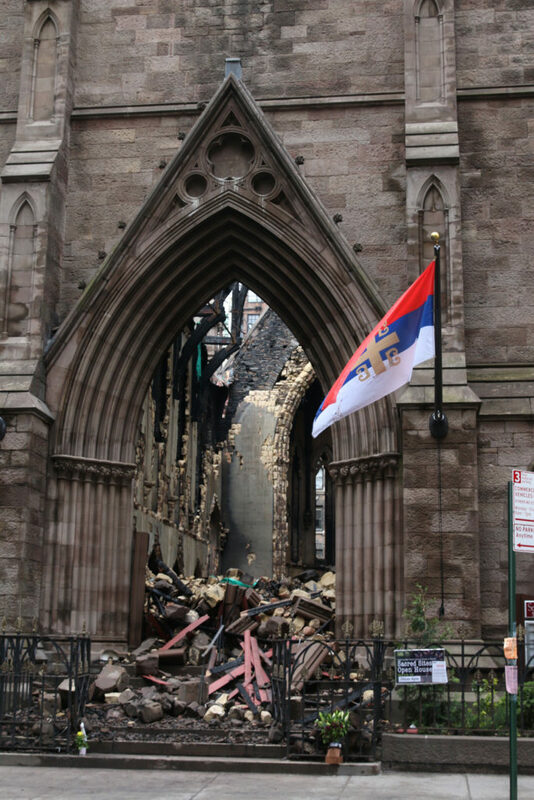 Days after being ravaged by an Orthodox Easter Sunday fire, the Serbian Orthodox Cathedral of St. Sava looks like a bombed-out husk. The windows are blown out. The timber roof, one of the largest in the city, was destroyed. What remains of it is skeletal. The interior is a pile of rubble. But the English Gothic-style stone walls – put up between 1850 and 1855 – remain intact and, according to the Department of Buildings, are not in immediate danger of collapse. The 160-year-old church was destroyed by fire on May 4, 2016. The 19th-century structure, landmarked in 1968, now sits in ruin. To bring the cathedral back to its prior state will cost the Serbian Orthodox Church tens of millions of dollars. The interior, which was made mostly of wood and glass, will have to meet modern safety standards. And even if the structure is rebuilt, the church will have to work with the Landmarks Preservation Commission to bring it back to acceptable historical standard. “It’s still a landmark until the landmarks commission or the City Council — who has override power — says otherwise,” according to Sean Khorsandi, with the private landmark advocacy organization Landmark West! In the English countryside, St. Sava’s buttressed, brownstone exterior would be imposing, but in Manhattan, it almost looks compact, nestled between larger commercial buildings in the shadow of the Empire State Building. The church was consecrated as Trinity Chapel in 1855 and served the wealthy Episcopalian parishioners of Wall Street’s Trinity Church who’d migrated north. More than 700 churchgoers used to come to St. Sava on holidays. The Serbian Orthodox Church purchased it in 1944. 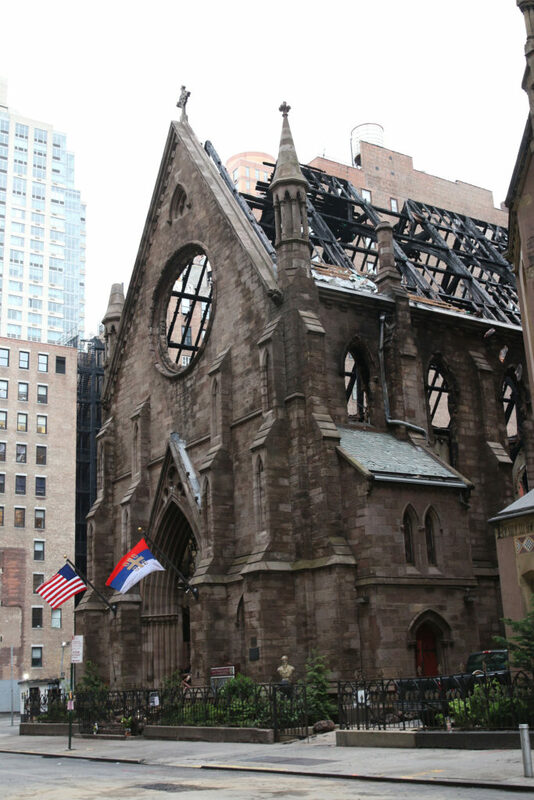 Consecrated the next year, it was and is still the only Serbian Orthodox Church in New York City. The church also serves as a bastion of Serbian culture and community. The building, described by the Landmarks Preservation Commission as “rugged” and “pleasing,” was given landmark status for, its character, its historical and aesthetic interest and its value as part of the development, heritage and cultural characteristics of New York City. The church has begun taking donations to rebuild, and according to a press release, is committed to restoring religious service at the site. And it will remain a landmark. This means the church will have to work with the landmarks commission in doing its restoration. These measures are usually agreed to under a “Certificate of Appropriateness Application,” said Khorsandi. These applications must be approved before any non-minor additions, demolitions or the removal of “significant architectural features,” according to the commission. “The landmark commission understands that buildings need to change, even landmarks,” said Khorsandi. The landmarks commission still regulates a landmarked site, even if the building is destroyed, said Andrew Dolkart, professor at Columbia University. “The designation of a property is legally unaffected by its condition or even its nonexistence,” he said. If the church was rebuilt from scratch, the parish would have to build it to specifications that the original building didn’t have to meet, according to Dolkart. This isn’t the first landmarked house of worship to go up in flames. In August 1998, the historic Central Synagogue on E. 55th Street and Lexington Avenue burned in a blaze sparked by improper restoration methods. “They used a hot tar method they shouldn’t have been using,” said Livia Thompson, former senior director of the synagogue. Like St. Sava, Central Synagogue’s interior and roof were destroyed, but the stone walls held. And, like St. Sava, only the exterior was landmarked. The restoration took three years and cost $49 million. Insurance and a settlement with the firm that caused the fire covered only a portion – leaving the congregation to raise $20 million. The landmarks commission was happy with the rebuild, Thompson said. The commission insisted on a sprinkler system, though the synagogue worried that a false alarm could set the sprinklers off and significantly damage the synagogue’s interior and treasures, Thompson said. But they were able to hash out a compromise. She said they put a sprinkler system in on the first floor, and upstairs they installed a “bells and whistle system” that didn’t include sprinklers. The synagogue solution was possible because landmark buildings don’t necessarily have to meet Department of Building codes. “Whatever state they’re in, that’s the state they’re landmarked in,” said Barbara Zay, manager of preservation at the Historic Districts Council.